Seiki KURODA (far-right in the back row) and his relatives. 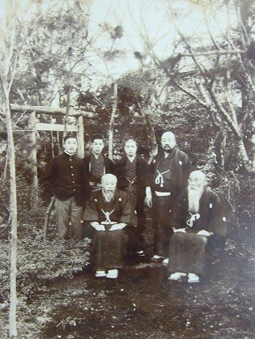 His birth father, Kiyokane, is on the left side of the front row while his adoptive father, Kiyotsuna, is on the right side. Photographed at his home in Hirakawa-cho in 1904. On December 26th, 2017, a monthly seminar was held by the Department of Art Research, Archives and Information Systems and the following researchers presented at the seminar. Mr. Chikamatsu reported on his research of letters written to a western-style painter Seiki KURODA (1866–1924), owned by the Institute. Research on the letters sent to this painter has been repeatedly reported at this seminar. Mr. Chikamatsu targeted his research on the letters written by his family members and relatives, including his birth father Kiyokane (1837–1914), his adoptive father Kiyotsuna (1830–1917), the Hashiguchi family, into which his adoptive sister married, and the Kabayama family, which adopted a child from the Hashiguchi family. Like the letters written by his adoptive mother Sadako presented by Mr. Jun TANAKA at the seminar held in August 2016, the letters reported here also showed that his relatives discussed Seiki’s change of profession from a lawyer to an artist during his stay in France. Mr. Tanaka presented on the paintings of Ryusei KISHIDA (1891–1916), a western-style painter, during the period that he lived in Yoyogi, Tokyo (1913–1916). In his book titled “Ryusei’s Book of Paintings and Artistic Views” (published in 1920), he referred to the great masters in Europe, such as Albrecht Dürer, Andrea Mantegna, and Jan van Eyck, saying, “It was really nice and reasonable for me to be influenced by these classical works of art.” Among them, Mr. Tanaka paid attention to Andrea Mantegna, an Italian Renaissance artist. Following a discussion of his process of accepting classical works of art based on the European book of paintings, which Ryusei may have watched, the presenter closely examined Ryusei’s process of establishing realistic expressions in his representative work, “Sketch of Road Cut through a Hill” (painted in 1915), and others. During the first half of the meeting, Mr. Yohei YAMAMOTO (Omatsuri Japan), who has been working on regional revitalization by coordinating “Festivals” from a corporate perspective, Mr. Shutaro KOIWA (Japan Folk Performing Arts Association), who has been supporting national folk performing arts, and Mr. Hiromichi KUBOTA, Head of the Intangible Folk Cultural Properties Section, gave presentations under the theme “Challenges in Festivals.” In the last half, participants were divided into seven groups for discussion in response to the presentations. 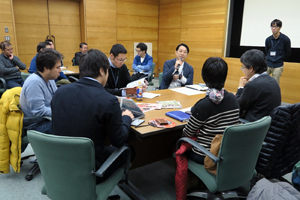 Finally, each group reported on “Challenges in Festivals,” expecting further progress at the next meeting. This network meeting will be ongoing as an opportunity to share opinions among successors, supporters, lovers, researchers, and others who are involved in “Festivals” in various ways. The 12th session of the Intergovernmental Committee for the Safeguarding of the Intangible Cultural Heritage was held in Jeju, the Republic of Korea, from December 4th through December 9th, 2017, which three researchers of this Institute attended. 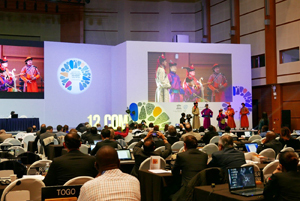 As the number of agendas to be addressed at the Intergovernmental Committee has increased in recent years, the session took place over six days, one day longer than the last session. 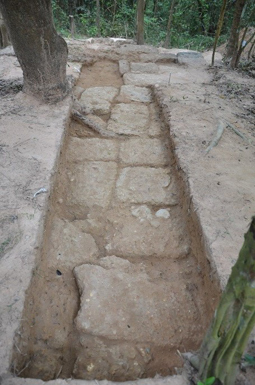 At this session, six elements were newly inscribed on the “List of Intangible Cultural Heritage in Need of Urgent Safeguarding,” while 33 elements were inscribed on the “Representative List of the Intangible Cultural Heritage of Humanity.” This time, Japan did not propose any elements. In the discussion under the Agenda 15 “intangible cultural heritage in emergencies,” the Japanese delegation introduced two cases: “disaster prevention for intangible cultural heritage,” which this Institute has been working on, and “Safeguarding of Intangible Cultural Heritage under Natural Disasters and Armed Conflicts in the Asia-Pacific Region,” which the International Research Centre for Intangible Cultural Heritage in the Asia-Pacific Region (IRCI) has been tackling. We distributed brochures titled “Disaster Prevention for Intangible Cultural Heritage,” prepared by the Department of Intangible Cultural Heritage of the Institute in March 2017. 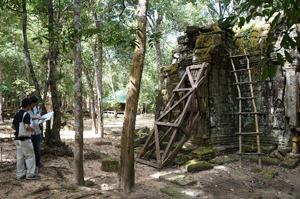 The issue of how to safeguard intangible cultural heritage from natural disasters has been attracting global attention. Under the circumstances, the Institute has accumulated numerous experiences on protecting cultural heritage from disasters through rescuing cultural properties after the Great East Japan Earthquake, supporting recovery from the March 11 Earthquake, and establishing the Intangible Cultural Heritage Archives. We think it is an important role for this Institute to contribute to the international community by disseminating these outcomes. The Tokyo National Research Institute for Cultural Properties conserves and restores cultural properties, as well as conducts research and study in collaboration with educational/research institutes, private and other organizations, not only at home but also abroad. 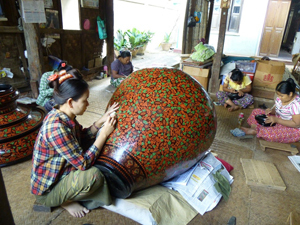 As one of these activities, the Institute reached an agreement on the protection of lacquer work cultural heritage in Myanmar with the Small-Scale Industries Department of the Ministry of Co-operatives, Myanmar in 2014 while organizing a workshop on lacquerware at Bagan Lacquerware Technology College in 2016. Even after the expiration of the agreement, another workshop was held at the College in February 2017, where lacquerware was practically observed and lectures on conservation/restoration cases and scientific analyses were given, maintaining the cooperative relationship. On December 7th, 2017, we visited the College to decide on the policies for future cooperative programs by exchanging opinions. 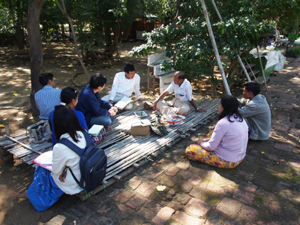 Its main topics were the safety and features of lacquerware sold in the Bagan area from a scientific perspective, and both parties agreed that mutual understanding should be promoted further. In addition, we visited lacquerware production sites in Myanmar for future cooperation on December 7yh and 8th, promoting a better understanding of Myanmar’s lacquerware. As part of the above-mentioned project commissioned by the Agency for Cultural Affairs, we have continually provided technical assistance for Nepal. From December 23rd through December 29th, 2017, we dispatched five experts to Kathmandu. 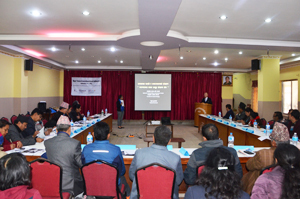 The main purpose of this dispatch is to cooperate in the “Mayors’ Forum on Conservation of Historic Settlements in Kathmandu, Kavre Valley.” The Forum was hosted by Panauti municipality, which has historic settlements inscribed on the Tentative List of World Heritage sites, and attended about 100 persons to its city hall, including mayors, deputy mayors or representatives from 16 cities located in Kathmandu, Kavre Valley and around Panauti City. 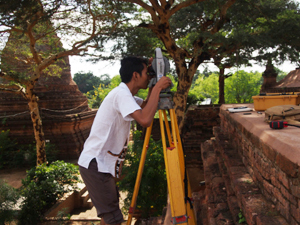 Since 2016, Tokyo National Research Institute for Cultural Properties has been providing support through workshops and training seminars for professional officers (engineers) of each city holding jurisdiction over historic settlements inscribed on the World Heritage List and the Tentative List of World Heritage sites. They have already established inter-city cooperative relationships. 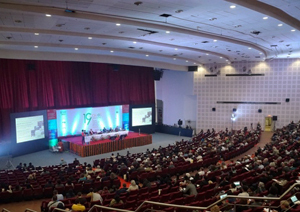 In this Forum, the necessity of networking the municipalities holding jurisdiction over historic settlements in Kathmandu, Kavre Valley (cooperation council) was shared among the mayors by expanding the coverage further. 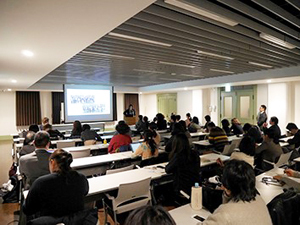 Lectures were also delivered by Professor Yukio NISHIMURA at the University of Tokyo regarding the survey of historic settlements in Kathmandu Valley being implemented under the framework of this cooperation project, and by Mr. Tatsuya KUMAMOTO, Councilor for Cultural Strategy of the Agency for Cultural Affairs, concerning the system for preservation districts for groups of historic buildings in Japan. We succeeded in conveying the approaches to conserve historic settlements, including the current issues and inter-government cooperation, to the participants. To establish a system to conserve historic settlements in Kathmandu Valley, a great deal of effort is required from a variety of stakeholders. We expect that our research outcomes will be reflected more effectively and that broader technical assistance will be provided smoothly through the above-mentioned network.